​Already struggling this year to think of things to make for dinner, and I hate to supply you with a repeat performance but….breakfast for dinner is so good! And since it’s been two days and I’m still not a morning person what could be better! 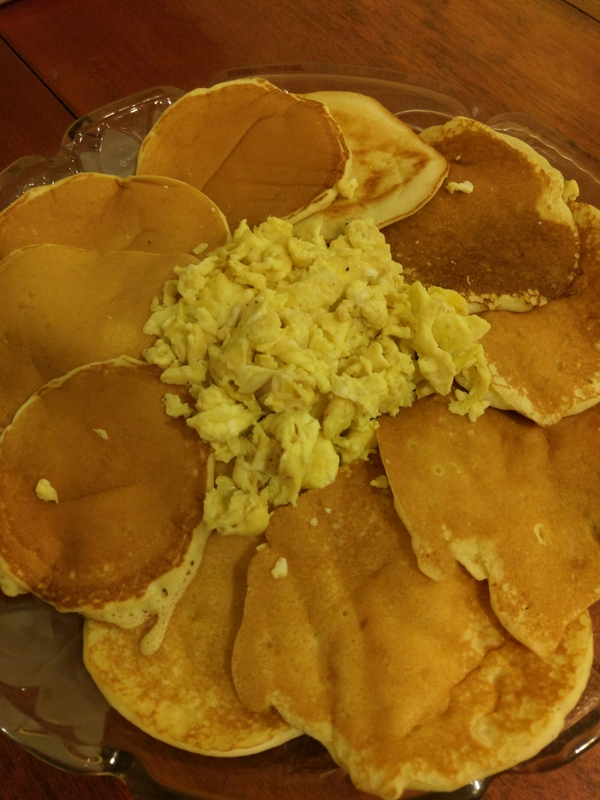 I used Betty Crocker’s pancake recipe and doubled it for my family, a side of scrambled eggs, served up family style is the perfect combo on this laid back evening at home. Here is the recipe as I prepared it, the link to Betty Crocker’s site is in my post from September 4th, 2016. Enjoy!! Lightly beat eggs and then stir in remaining ingredients until flour is moistened , it may be slightly lumpy. Heat griddle over medium high heat and coat with non-stick cooking spray. Pour 1/4 c. of batter onto the hot pan, wait until bubbles form and edges appear dry before turning.